617 pages | 224 Color Illus. | 224 B/W Illus. Designing a complete visualization system involves many subtle decisions. When designing a complex, real-world visualization system, such decisions involve many types of constraints, such as performance, platform (in)dependence, available programming languages and styles, user-interface toolkits, input/output data format constraints, integration with third-party code, and more. Focusing on those techniques and methods with the broadest applicability across fields, the second edition of Data Visualization: Principles and Practice provides a streamlined introduction to various visualization techniques. 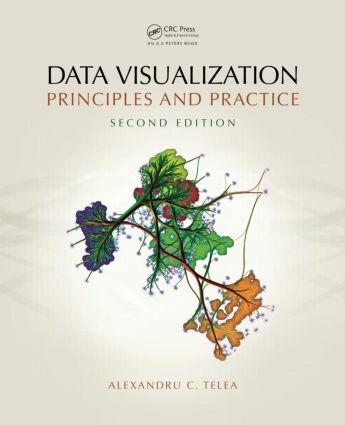 The book illustrates a wide variety of applications of data visualizations, illustrating the range of problems that can be tackled by such methods, and emphasizes the strong connections between visualization and related disciplines such as imaging and computer graphics. It covers a wide range of sub-topics in data visualization: data representation; visualization of scalar, vector, tensor, and volumetric data; image processing and domain modeling techniques; and information visualization. Algorithmic and software design issues are illustrated throughout by (pseudo)code fragments written in the C++ programming language. Exercises covering the topics discussed in the book, as well as datasets and source code, are also provided as additional online resources. "… an ideal textbook for academic course work and should be an integral part of all academic library instructional reference collections." Introduction. Computer Graphics and Visualization. Discrete Data Representation in (Scientific) Visualization Applications. Visualization Pipeline. Fundamental Techniques for Scalar Visualization. Vector Visualization Techniques. Tensor Visualization Techniques. Domain Modeling Techniques. Scientific Visualization and Signal/Image Processing. Scalar Visualization. Information Visualization (Infovis) Techniques. The Value and Price of Visualization. Challenges and Prospects of the Visualization Field. Appendix.